You might not know me yet, but once you open the pages of this book you'll laugh so hard that snot will come out of your nose (plus you might meet a dragon and a zombie - what more could you want?). My parents decided it would be a good idea to move house AND move me to a new school at the same time. As if I didn't have a hard enough time staying out of trouble at home, now I've also got to try and make new friends. What's worse, the class bully seems to think I'm the perfect target. At least Eid's around the corner which means a feast (YAY) and presents (DOUBLE YAY). Well, as long as I can stay in Mum and Dad's good books long enough... 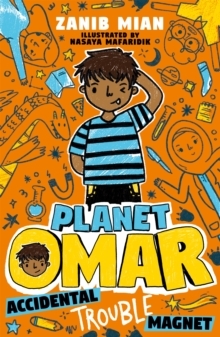 The combination of Zanib Mian's hilarious text and Nasaya Mafaridik's fantastic cartoon-style illustrations make the PLANET OMAR series perfect for fans of Tom Gates and Wimpy Kid. Previously published as 'THE MUSLIMS', this was the winner of the Little Rebels Award in June 2018. The text has been revised, expanded with new scenes and re-illustrated.